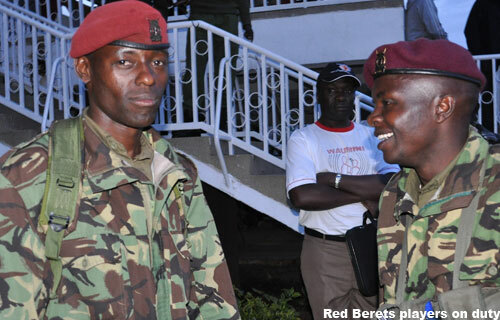 Former Kenyan premier league club Red Berets FC has been disbanded. From our reliable sources, official communication suggests the team was disbanded this morning (Thursday) and the players will be redeployed to their various posts. Team manager Solomon Makhanu when contacted for comments about the same could not confirm the news saying he is yet to seek audience with the club’s Patron for advice on the way forward for the club. “ I cannot confirm anything about that but the players have been under immense pressure from the sponsors to perform exceptionally well. Last year was not so good for us and as you all know we were relegated but that does not mean the club has been disbanded. We will issue official communication once we receive the same from our sponsors but as of now I cannot say anything in regards to the same.” Said Makhanu. The paramilitary side had a poor season last year winning only seven matches out of the 30 played and drawing 13.This led to the team’s axing from the top tier league with a total of 31 points 28 adrift from the eventual winners Ulinzi Stars. The untimely disbandment therefore leaves the players at Crossroads especially following the close proximity of the KPL transfer window deadline set for 31st January.